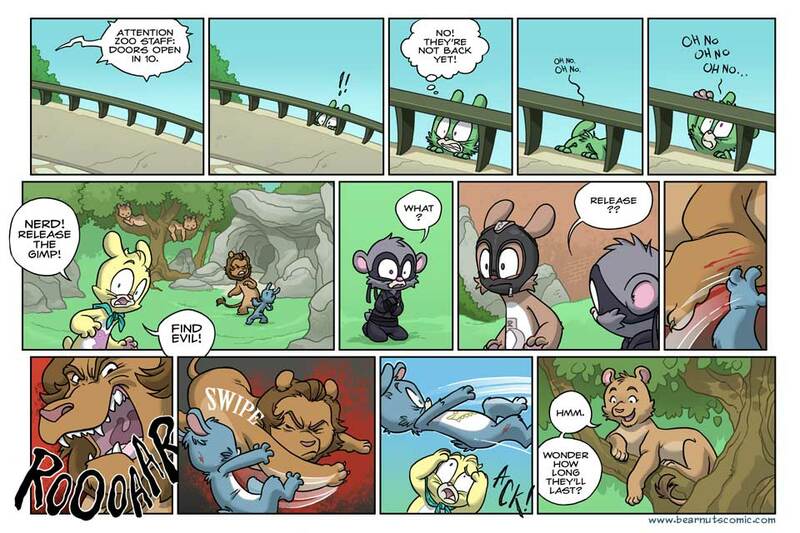 Vote Incentive: Justice Tree! Being able to fly would certainly make tree decoration easier. This entry was posted on Monday, November 19th, 2018 at 12:00 am and is filed under BEAR NUTS. You can follow any responses to this entry through the RSS 2.0 feed. You can leave a response, or trackback from your own site. That went as well I thought it would…Props for the effort I guess? *Shrug* I don’t know why but I love how nonchalant the lioness’ are. Like, oooh!! Entertainment!! Can’t wait for more. My wish for the next page is that in order to see who’ll be leader Gay and Lech have to beat the alpha of the lion’s in a dance off. Gay and Lech have to be dance partner’s and they are surprisingly good at dancing together, at the end of the Dance off Gay and Lech will win and Gay will kiss Lech in celebration. I wonder what the Gimp is going to do? eeeee, it’s finally happening! We’ll finally see what Gimpy’s hidden badassery is! And wooo…. I definitivly can’t wait for the next week for See what Gimp will do when his mask will be removed and is Nerd that have this responsability poor him X3…. So is Gimp’s mask like Jet Li’s collar in Unleashed, except his restraint is willingly accepted? OHHHH are we gonna see him mask-less?! Now that I think about it, I wonder if Gimp’s hidden “self” is going to be, instead of scary enough to stop the lions… what if he’s actually the most absolutely insanely adorable thing you’ve ever seen, even moreso than Vanity, and it’ll make everyone stop in their tracks to coo and aww at him?! Probably not, but it would be unexpected and funny after all the buildup! the snow caught everyone off guard. they said a dusting to maybe an inch… and we got 6-8 and it just buried everything. reminds me of the Ice Stom that hit right after Halloween years ago and froze the whole region for days. Holy crap! This is the first time I’ve ever felt MAD RESPECT for Lech! He’s fighting a MOFO LION! And I literally have no idea what will happen when the Gimp is released! Oh, the antici…………..
Oh, look at Lech fly. I wonder how long before the Lioness joins in. Felines often enjoy toying with their Prey. Release the Gimp! I’m looking forward to this.